Home / Publications / Is Nature Stable, Delicate, or Random? Americans conceptualize the balance of nature in very different ways. Some think the balance of nature is very stable, while others think it is very delicate, or alternatively, random and unpredictable. Differences in these underlying mental models about the balance of nature are also related to beliefs about specific issues. For example, people who believe nature is very stable tend not to believe that global warming is happening, while people who believe nature is delicately balanced are much more likely to believe global warming is happening. Here we explore these deep underlying mental models of nature, how they influence global warming beliefs, and which demographic groups tend to prefer one model vs. another. The analysis comes from a nationally representative survey on the environment conducted in November, 2014 by the Yale School of Forestry & Environmental Studies and the AP-NORC Center for Public Affairs Research. Which of the following statements best represents your understanding of the balance of nature? Four in ten Americans (41%) believe nature’s balance is “somewhat stable” – small changes don’t have lasting impacts, but big changes can be disastrous. Three in ten (30%) believe nature is random and unpredictable. One in four (23%) think nature’s balance is “delicate” – small changes can cause environmental disasters. Least commonly, 6% of Americans think nature’s balance is “very stable” – even large changes will not have a lasting impact. 2. 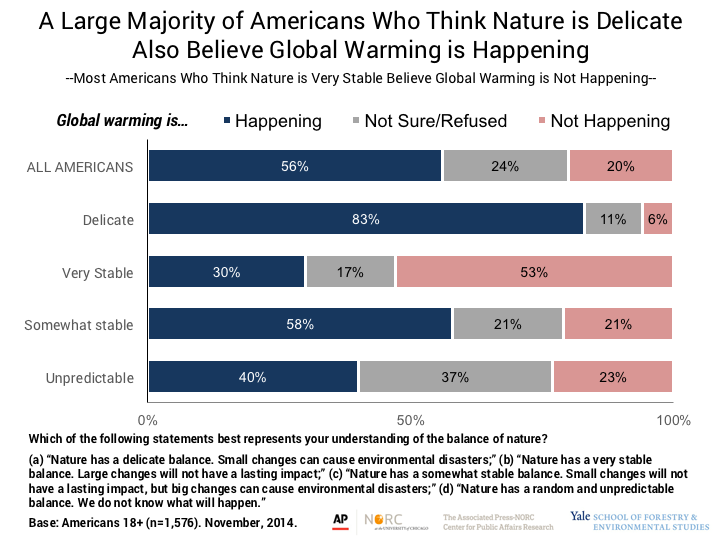 Most Americans who think nature has a delicate balance believe global warming is happening, while most Americans who think nature is very stable believe global warming is not happening. Mental models of the balance of nature are strongly related to beliefs about the reality of global warming. The great majority (83%) of Americans who think that nature has a delicate balance believe that global warming is happening. On the other hand, most of those who think nature has a very stable balance (53%) do not believe that global warming is happening. 3. 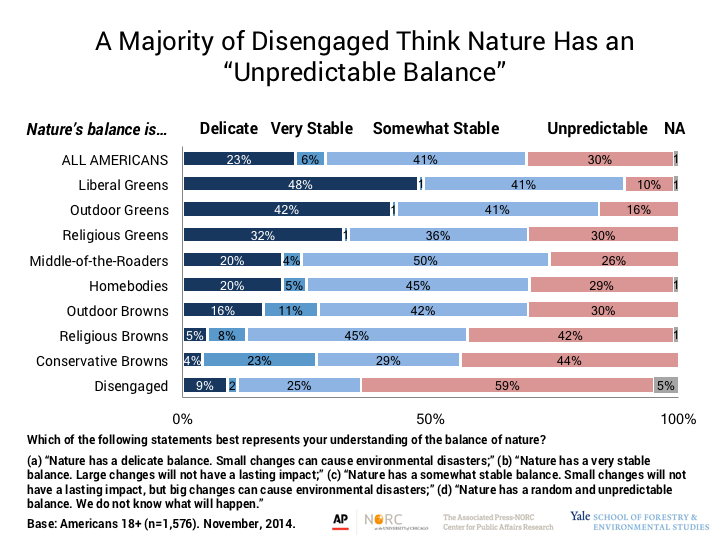 The environmentally “Disengaged” are most likely to think nature has a random and unpredictable balance. In a 2015 report, we identified nine segments of the American public based on their attitudes towards environmental issues, how they viewed themselves in relation to the environment, and how they responded when scientific and religious views about the environment came into conflict. The nine segments ranged from the “Liberal Greens” on the more environmentally-conscious side to the “Conservative Browns” on the anti-environmentalism side. Among the nine groups, Liberal Greens (48%), followed by the Outdoor Greens (42%) were the most likely to think nature has a delicate balance. Conservative Browns (23%) were the most likely to say that nature’s balance is very stable. But perhaps most striking was that among the “Disengaged” – those who are most apathetic about environmental issues – about six in ten (59%) think that nature is random and unpredictable, greatly surpassing any other group. Among their defining characteristics, the Disengaged are the only segment among the nine who are majority non-white. They also have the lowest incomes and educational attainment of the nine groups. 4. Americans with annual household incomes under $25,000 are most likely to think nature has a random and unpredictable balance. Demographically, four in ten Americans with annual household incomes under $25,000 (41%) think that nature has a “random and unpredictable balance,” more than any other income group. One potential explanation is that lower incomes are related to a reduced sense of control and efficacy, including over environmental hazards. People with less control over their lives may perceive nature to be more capricious. For example, lower incomes are often associated with greater vulnerability and lower resilience to environmental disasters. 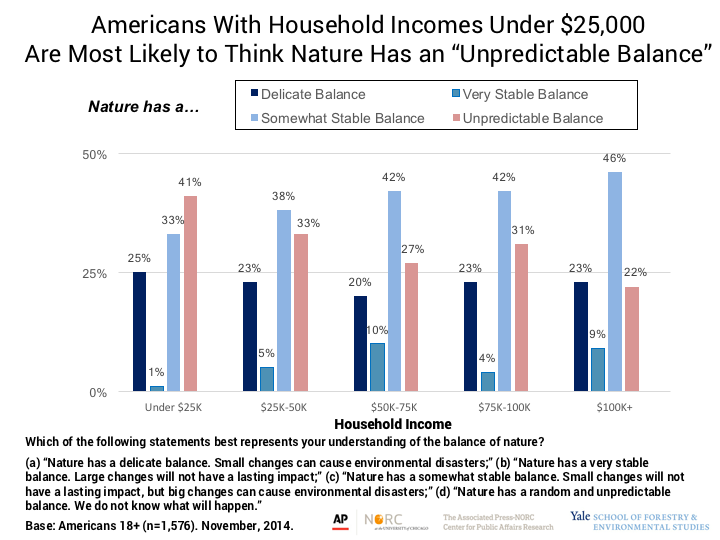 In contrast, as household incomes increase, people are more likely to believe that nature has a somewhat or very stable balance. Higher incomes often represent a greater capacity to prepare for, withstand, and recover from environmental disasters, perhaps fostering a greater sense that nature has a more stable balance. If so, this suggests that people may partially interpret the stability of the natural world through the lenses of their experience of the social world. People’s underlying assumptions about the balance of nature likely influence many of their subsequent judgements about the reality and seriousness of different environmental issues. Some reason that if nature is inherently stable and able to withstand the influence of any human activities, then most environmental “problems” aren’t problems at all. Others start from the assumption that nature’s balance is very delicate, thus the slightest human intervention can lead to cascading disastrous consequences. Others assume that nature is just random and unpredictable, so human activities have unknown impacts on a chaotic world. And finally, some view nature as having threshold effects – that nature is resilient to a limited degree, able to absorb and withstand some human impacts. But once those limits or thresholds are exceeded, disastrous environmental problems can occur. These differences in people’s underlying assumptions about how nature works can lead them to very different conclusions about the current state of the environment and what, if anything, we should do about it. This research suggests that educating people about how humans can disrupt the balance of nature and that many of the impacts are well understood and predictable by modern science could help lay the foundation for more constructive discussions about how to address environmental issues. The data in this report are based on a nationally representative survey of 1,576 American adults, aged 18 and older, conducted from November 20 – December 1, 2014. All questionnaires were self-administered by respondents in a web-based environment. The survey took, on average, about 22 minutes to complete. The survey instrument was designed by Anthony Leiserowitz, Geoff Feinberg, and Seth Rosenthal, of Yale University, and Jennifer Benz and Trevor Tompson of the AP-NORC Center for Public Policy Research. All samples are subject to some degree of sampling error – that is, statistical results obtained from a sample can be expected to differ somewhat from results that would be obtained if every member of the target population was interviewed. For this survey, the margin of error at the 95% confidence level is +/- 3 percentage points. Please note that this survey, conducted in November 2014, found that 56% of Americans at that time thought global warming is happening. Our most recent survey in November 2016, however, found that 70% of Americans think global warming is happening. Opinions have changed since 2014, but the underlying relationship between public mental models of the balance of nature and beliefs about global warming is unlikely to have changed much. More detail about the image: Stone Circle by Martin Hill was an early work that came about through experimentation and thinking about cyclical restorative processes in natural systems as a model for our own design systems to become regenerative. There is no waste in nature, everything becomes food for something else. For the sculpture pumice stones were threaded on a willow stick to create an arch. When reflected in a pristine lake at dawn the circle was made complete. Martin Hill has spent more than 20 years making and photographing ephemeral environmental sculptures that are disseminated to world audiences via publishing, exhibiting and the internet. He works in wild natural places around the world, in collaboration with his partner Philippa Jones, utilizing processes and forms that reflect nature’s cyclical regenerative system. His intent is to illuminate how our unsustainable economic model can be reversed through better systems design informed by the way nature works. A book Earth to Earth featured sculpture photographs alongside writings from world leaders in sustainable design. A film Delicate Canvas followed Hill and Jones’ art practice in the New Zealand mountains over a year. The Fine Line Project, begun 1995 and nearing completion, features a line drawn around the earth linking ephemeral sculptures they made on 12 high points. Interconnectivity, circularity, regeneration by design and biomimicry are its themes. Cutler, M., Leiserowitz, A., and Rosenthal, S. (2017). Is nature stable, delicate, or random? Yale University. New Haven, CT: Yale Program on Climate Change Communication.